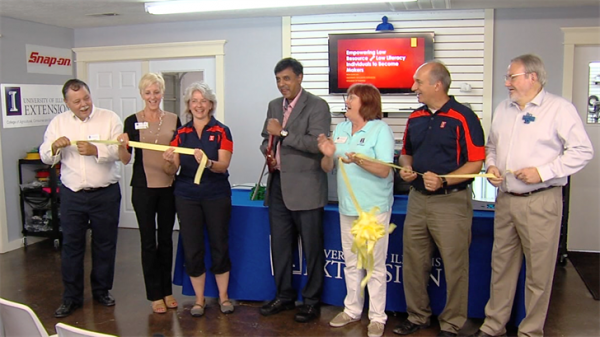 IMMLP recently worked with University of Illinois Extension to establish a new technology center to help promote economic development and innovation in Harrisburg, Illinois. The Community Innovation Center (CIC) combines marketplace and maker literacy with a maker lab to give area residents an opportunity to take a concept from the idea phase and turn it into a tangible, completed prototype, setting this center apart from other business development projects. In addition to 3-D printers and software, the center includes computer-controlled wood- and metal-shaping equipment — all in an environment open to the public. A partnership with ITG3D, a local non-profit dedicated to the training and education of the community in new and developing technologies, also helped make the new center possible. The center opened for free classes on business literacy and 3-D printing July 1, 2017 and will open for production in August.